With our Bluescope Colorbond® steel gutter protection systems, GumLeaf is the perfect answer for your roofing and gutter worries. Leaf & debris build-up and pest infestation are often precursors to bushfire and water damage, especially when left unattended. GumLeaf Gutter Protection effortlessly keeps leaves and debris away from your gutters to prevent blockages, pest infestation and water overflow. Our gutter guard systems are tough with a zero flammability index and high anti-corrosion performance as they are made of genuine Australian BlueScope Colorbond® steel, a high-performing material that rolls strength, performance and durability into one. 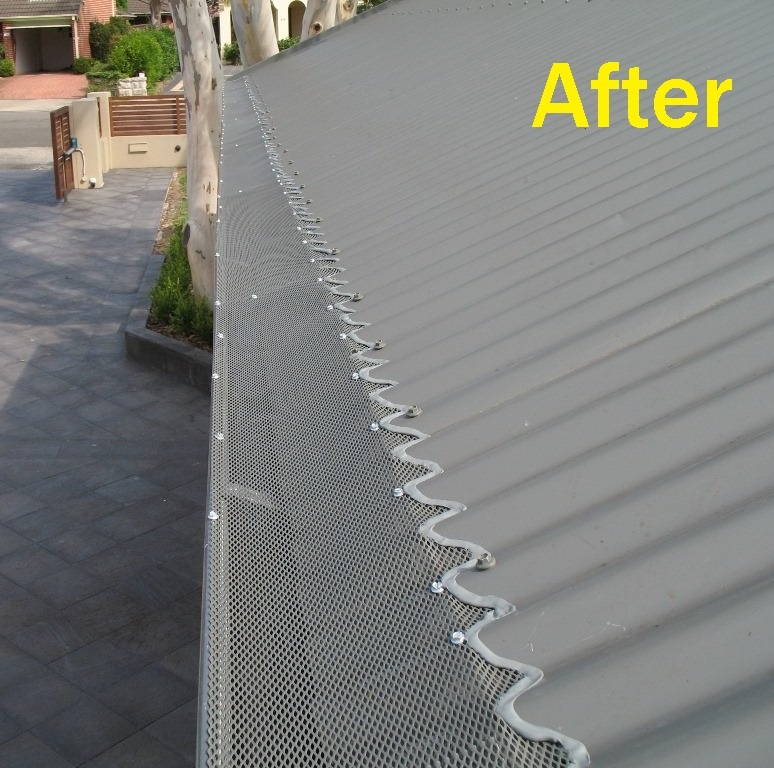 While most gutter guard are effective to a degree, our Australian designed BlueScope Colorbond® gutter guard systems can withstand the harsh sun, a drenching downpour or even the worst cyclone. Our installation method is second to none since we use the self-tapping screw system and then silicone the edges for a clean and secure finish. 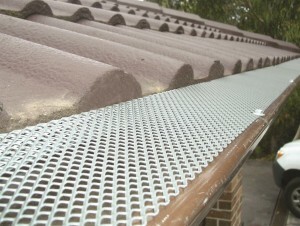 GumLeaf’s revolutionary steel gutter guard provide exceptional gutter protection in today’s market. We offer a wide range of colours, so we are sure to have the perfect match for your existing roof and gutter profile, be it residential or commercial. GumLeaf uses the highest quality BlueScope Colorbond steel. This is ideal for commercial and residential applications. Steel is the best material for your gutter protection but it needs to be the highest quality Bluescope Colorbond steel which GumLeaf uses, in order to last and perform. Your guard should never be plastic or sprayed metal. GumLeaf’s Colorbond exclusive patented louver design with three dimensional eye shaped holes allows water to ripple through into the gutter but at the same time leaves to blow off. 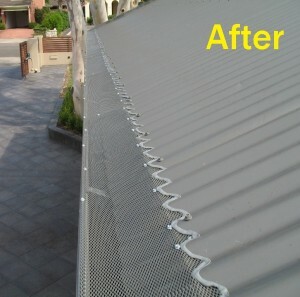 This gives it the best performance possible which has helped make GumLeaf’s Colorbond Gutter Guard so famous. 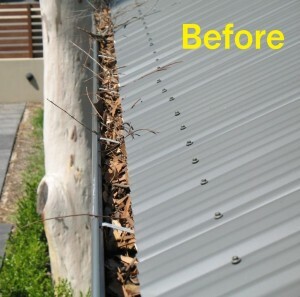 Due to its innovative design GumLeaf’s Colorbond is one of the best looking gutter guard on your roof. For corrugated roofs the colour of GumLeaf’s Colorbond is matched perfectly with the colour of your Colorbond roof. Special machines scallop the shape to fit the corrugations perfectly and easily which means no saddles or trims on your roof. For tile roofs GumLeaf’s Colorbond is very discrete as it tucks in under the first tile (and not over) and cannot easily be seen from the ground. GumLeaf’s Colorbond has a CSIRO rating of “0” – the best possible fire protection there is. 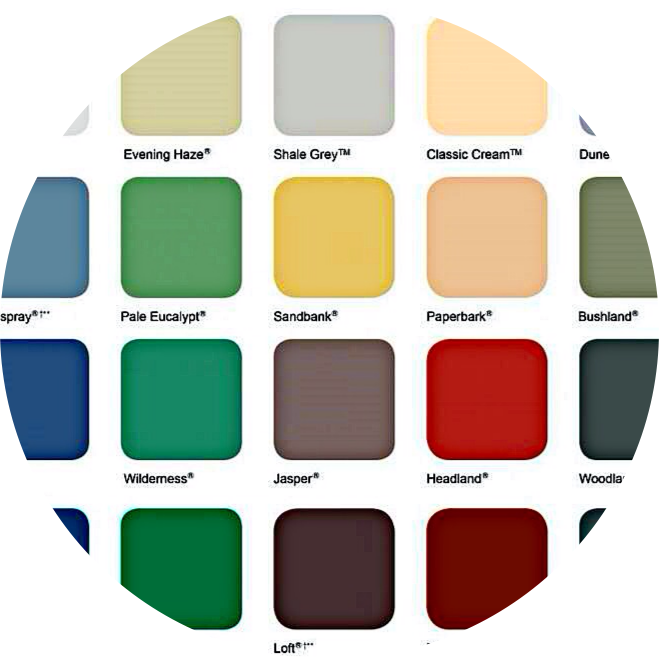 There are 20 colours to choose from to perfectly match the colour of your corrugated roof. For tile roofs we can custom make the “fold” so that GumLeaf’s Colorbond will fit your roof perfectly. Order your specific requirements at the Special Orders Desk at Bunnings. 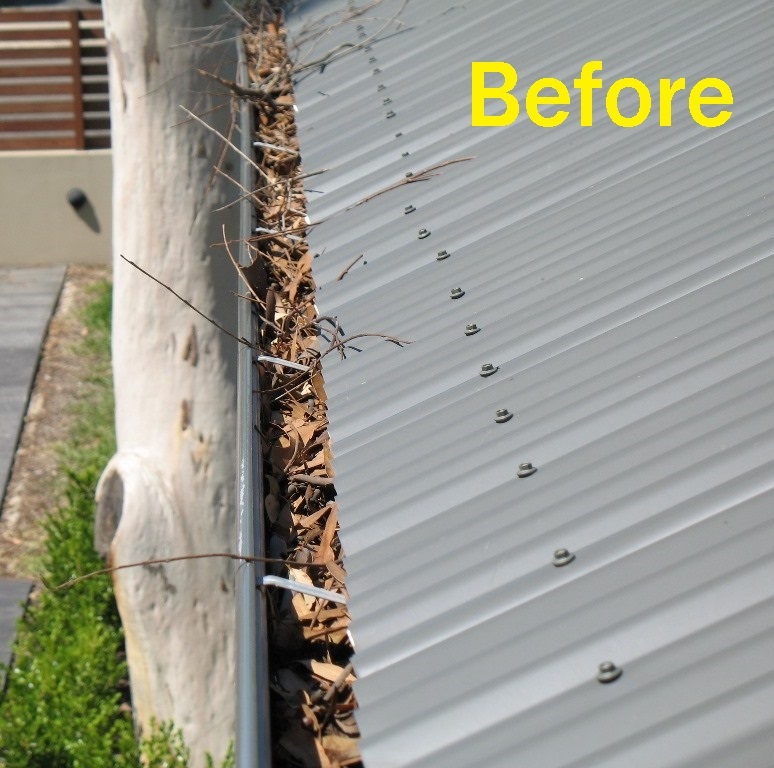 Innovative 1 – A recent addition to the Colorbond range is the GumLeaf’s Screwless Gutter Guard which eliminates screws in your gutter. Innovative 2 – Another recent addition is the GumLeaf’s 3D Gutter Guard which has been designed for homes which have cyclone clips installed on the roof. GumLeaf’s Colorbond has proven performance – it has been successfully used for over 18 years. As seen on and endorsed by Better Homes & Gardens. 25 year performance warranty for your peace of mind. Durable and highly functional Bluescope Colorbond steel. Exclusive patented design means fantastic performance. Colorbond will look great on your roof. Has the highest fire rating possible. This will help protect your home in the event of a bush fire. Twenty colours for corrugated roofs and custom folds for tile roofs ensure a perfect fit for 99% of roofs. Proven performance & reliability as has been used successfully for over 18 years in Australia.